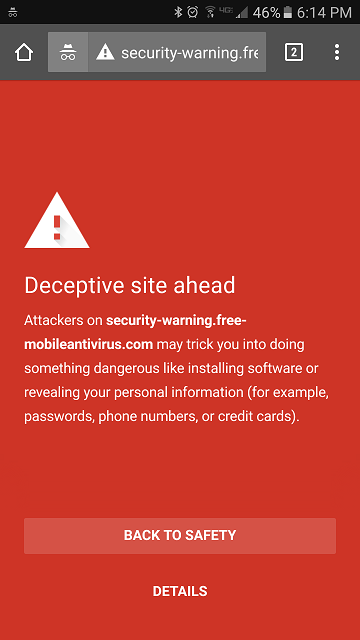 Is The Blaze Installing Malware on Android Phones? Home → Uncategorized → Is The Blaze Installing Malware on Android Phones? A few months ago I slapped a random article up on this site about the Drudge Report infecting cell phones. It is not really the Drudge Report but people exploiting the advertisement delivery networks content curators and producers utilize to monetize their sites. In other words: ad servers are exploited to display messages on your phone in an effort to trick you into installing something. Does this occur at The Blaze? Today someone left a comment on the Drudge Report malware article that said they get popups on TheBlaze.com. The Blaze is a site owned by (I think) Glenn Beck and has a bunch of dramatic headlines and is plastered with ads. Please keep in mind, this isn’t The Blaze serving up scam warnings on your cell phones and tablets: any site that uses this many ads is bound to serve up something they don’t like at some point. When you see something like this, do NOT click on “back to safety” or “details”. Heck, don’t click anything. Hit “back” on your device if you can. If you can’t, Force Close the browser. What kind of cell phone were you using? Did you try and tell The Blaze about it?